Emphasising natural lighting is one of the easiest ways to make your kitchen look bright and airy. To make your kitchen feel brighter try reorganising the furniture so that it does not obstruct your natural lighting. 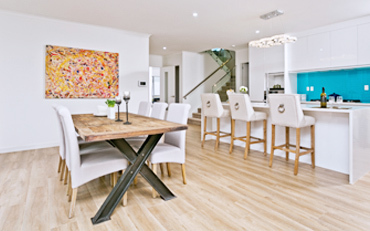 We recommend positioning your dining table where there is the most natural light. You could also add more natural light, for example combining two rooms together. If you are undertaking a big kitchen renovation, you might want to consider knocking down a wall to open up your kitchen. This will increase the amount of natural light in your kitchen and will make your kitchen feel a lot more airy and spacious. To update your cabinets and kitchen doors, we suggest adding a touch of paint. Some popular colour trends for kitchen interiors in 2017 include the use of green, blue, white, off white and grey undertones. Opting for a glass subway tile is a fantastic way of reflecting and maximising natural light. Alternatively, you could try using boldly patterned tiles, for example, a hexagon tile backsplash would add depth to the layout of your kitchen. Adding reflected surfaces to your kitchen can help to maximise light in your kitchen area. You could consider using classic metals such as chrome or stainless steel. Using reflective surfaces in your kitchen can create the illusion of more space in a smaller kitchen. Another significant trend this year is the use of open shelving. Open shelving helps to break up the layout of a kitchen whereas having blocks of large cabinets can make your kitchen feel quite compact. Open shelving has the potential to make the design of your kitchen feel more open. Incorporating open shelves in your kitchen will also make your kitchen utilities readily available. You could also try adding decorative touches such as flowers to your open shelves, this will help to give your kitchen that summery feel.